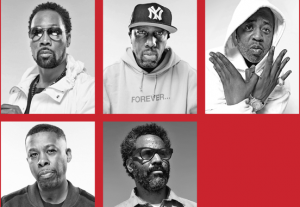 Join us for an exciting evening with hip-hop legends RZA, Inspectah Deck, and Cappadonna from Wu-Tang Clan, and filmmaker, writer, and musician Sacha Jenkins. The group will discuss Showtime’s upcoming docu-series “Wu-Tang Clan: Of Mics and Men,” which features interviews with the group’s nine living members as well as never-before-seen archival footage and concert video. The series follows the founding Clan members — many of whom were childhood friends in the hardscrabble world of ’70s and ’80s Staten Island and Brooklyn.